Athletico is proud to be the Official Provider of Physical Therapy for The Joffrey Ballet for over 20 years. Through this partnership, our physical therapists are onsite throughout rehearsals and performances, including the busy Nutcracker season, in order to keep dancers healthy and performing to the best of their ability. 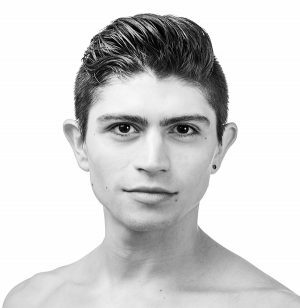 To learn more about what it takes for a dancer to get through Nutcracker season, which includes 30 shows in one month, we reached out to Aaron Renteria, who is in his third season as a Joffrey dancer. Read below to learn about what it takes to get through a busy dance season, as well as some of the injury risks that dancers face. 1. Can you tell us a little bit about your dance career (when you started dancing, how long you have been dancing with Joffrey, etc.)? I started dancing tap when I was 9 years old at a small competition studio in Corona, CA. After a year, I had fallen in love with performing and being on stage and started competing in tap, jazz, lyrical and hip-hop. Ballet was always a requirement to take when competing and wasn’t my favorite at the time, but in order to compete I was determined to take whatever classes I needed to. During the five years I competed, my main ballet teacher at the time told me to audition and attend summer programs at Long Beach Ballet, American Ballet Theatre and San Francisco Ballet School. When I was 14, I was invited to stay for the year-round program at San Francisco Ballet School and I accepted. Within that year, I saw the reparatory of San Francisco Ballet with their incredible dancers and fell in love with dancing ballet the more I trained and the more I saw the company dance. It was then that I knew that I wanted to be a ballet dancer and perform professionally and would do anything I could to reach my goal. I trained in the school for five years before I was offered a contract to dance for San Francisco Ballet. After three years of being in the company, I found myself dancing in the back for most rehearsals and being mainly second and third cast for full lengths and new works. I wanted more opportunities to be onstage and be pushed to dance certain roles and in ballets I’ve always wanted to perform, so I took class with Artistic Director Ashley Wheater and Joffrey Ballet in November of 2015 in hopes of being remembered during audition season. In March of 2016, I received an email from Ashley saying he was in San Francisco at the time and wanted to have a meeting with me. It was then that he offered me a company contract to dance under him at Joffrey Ballet and immediately I graciously accepted. This is now my third season dancing with Joffrey Ballet and I’ve cherished every moment I’ve gotten to perform and dance with the company. 2. How is Nutcracker season different than the rest of the year? Nutcracker season is different because instead of doing about 10 shows which is the usual amount we do per program, we perform around 30 shows all throughout the month of December. Also because it is a full company production, most of us are needed to perform in every show. Luckily we’re not doing the same thing each time, one day you might just be performing Flowers/Fair Visitors and that same evening you could have a full show of Party, Battle, Snow and Flowers/Fair Visitors that involves tons of quick changes and lots of running around. So it’s pretty exciting and keeps you on your feet, but because of how long the run is, you need to take it one day at a time and focus on what you’re performing at that time. 3. How frequently do you deal with injuries? Every dancer deals with aches and pains, it comes with the job. But I’ve definitely had my fair share of injuries. The type of injury it is can usually depend on what we’re rehearsing at the time, since we’re trying to perfect our steps and partnering before we open a program. But at the same time, we’re only human and mistakes happen. Sometimes we may land from a jump the wrong way or sprain an ankle, especially if your body is already exhausted from being overworked. That’s why it’s so important for us to take care of our bodies even outside of the studio by eating right, icing, cross training, and rolling out muscles because our bodies are our instruments. 4. How do you know when an injury is serious enough to miss a performance? Personally, I’m the kind of person that hates giving up and not being able to perform, so even if something hurts I’ll still give 100 percent and give it my all. But when it’s impossible for me to do a plié and jump or point my foot, then I know that it’s better for me to rest and recover so I can perform again later. 5. What are a few of the most common injuries that dancers experience? Some common injuries that dancers experience in their careers are sprained ankles, meniscus tears, tendinitis, dropped metatarsals and skeletal alignment issues. More severe common injuries include ACL tears and stress fractures. 6. Are there injuries that are more common in male dancers vs. female? Definitely! For male dancers most injuries occur in the back, knee, and upper body due to difficult partnering and jumps. For female dancers, foot and ankle injuries are pretty common due to the amount of pointe work they’re required to do. 7. What was the most difficult injury for you to overcome/How did you overcome it? The most difficult injury I’ve ever had to overcome was my Lisfranc Ligament Tear in my right foot. In December of 2015, I was overworking myself with shows of Nutcracker, working out intensely to build more muscle, and rehearsing variations to record to send out for auditions. Because I was putting so much stress on my body, my muscles and ligaments were more prone to being inactive and unstable. So after one Nutcracker show, on my way home, I misjudged stepping off the sidewalk and at that moment the ligament connecting both my first and second metatarsal suddenly snapped. It was one of the worst pains I’ve ever felt and would never wish it upon anyone. After three weeks of believing it was a sprained foot after a misdiagnosis, I was taken to an orthopedist by my mom who is an RN. X-rays showed that my ligament had in fact torn completely and my metatarsals had slowly started separating. The doctor told me that if I hadn’t come in and waited another week my career would’ve been done. A few days later I was in a surgery center undergoing a procedure to put hardware in my mid foot to repair my ligament. It took seven months, two surgeries and lots of physical therapy until I could even start doing barre again. I had to relearn how to walk, stabilize, and regain control of all the tiny muscles and ligaments in my foot. When Ashley offered me a contract to dance at Joffrey, I still had two screws in my foot and he told me he had absolute faith that I would come back stronger than I was before. With him, the incredible ballet masters, the support of my Joffrey family, and the help from all the physical therapists who worked with me at the ballet and the Athletico clinic, I was jumping by September and fully dancing by October – just in time for the fall program of Romeo and Juliet in my first season! 8. What role does physical therapy play in helping dancers get through a busy time, like Nutcracker season? During a busy time like Nutcracker when we’re doing so many shows, it’s harder for muscles to activate as quickly when they’re exhausted. Especially when you’re trying to care for an injury at the same time. Physical therapy is so important for us because with the one-on-one time we get with our physical therapist, they help us recover from any pain and stiffness that may affect us with the choreography that we need to perform. Not only do they help us feel better, but they also go into depth about why certain muscles are tight, how to strengthen other muscles, and depending on how much pain we’re in at the time, they may even tape us with Kinesiology Tape to help support injured or weaker muscles. 9. How do you train in the offseason? During the off-season, I like to keep taking ballet classes around Chicago to keep my technique sharp enough for the upcoming season. Other than that, I like to swim laps which is a full body exercise in itself and great for stamina, as well as go to the gym at least 3-4 times a week while focusing on either abs and back, upper body, or legs and glutes. When it’s leg day, I do a certain workout called plyometrics which I started last summer. The point of plyometrics is to increase the speed and activation of your leg and glutes, which in the end improves the height of your jump. The workout itself is extremely tiring and difficult, but definitely gives you the results you want. Athletico is a proud partner of The Joffrey Ballet. To learn more about our performing arts rehabilitation services, contact us at PerformingArts@Athletico.com.